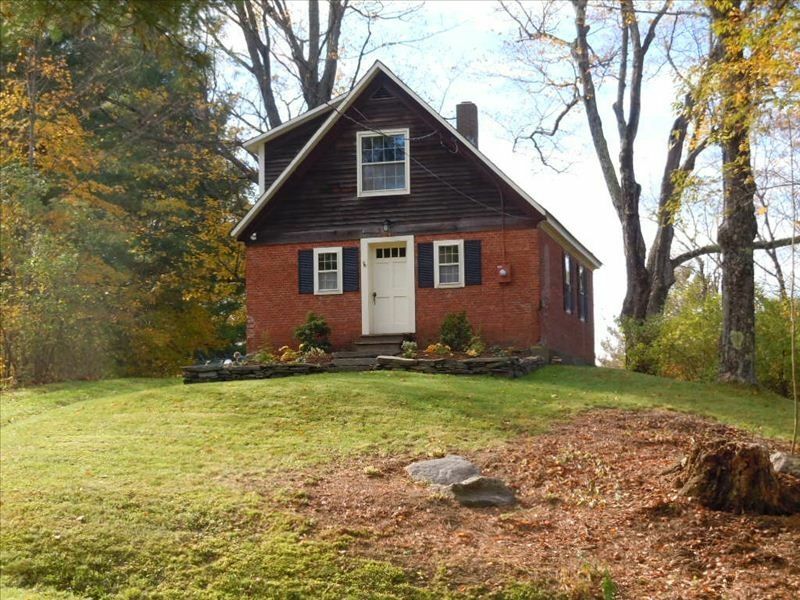 This exceedingly charming cottage on a wooded hilltop just outside of Brownsville has great views of Mt Ascutney and a burbling brook at the base of the hill. The historic converted early 1800's one room school house is filled with many antique furnishings. Hanging in the stairway are photographs of the house when it was the Hammond Hill School, with its teacher and her students. Enjoy the coziness of a gas fireplace in the living room or a wood fire in the chiminea on the deck. The cottage features a fully equipped and outfitted kitchen. Both bedrooms are upstairs, the master with a queen size bed and the second bedroom with a full-size double bed. The stairs are steep and may be a challenge for some individuals. All bed and bath linens are supplied. Mt. Ascutney, only 5 minutes away, with opportunities for hiking, mountain biking or cross country skiing. There is easy access to the VAST trail network for snowmobiling, cross country skiing or snow shoeing. Mountain bikers will find some of the best single track trails in New England. Miles of great trails are accessible right from the house. Ascutney Mountain Resort has many amenities including a shop for kayak and bicycle rentals. There is a full restaurant and bar available in the main lodge. In addition, the resort has outdoor tennis courts and a heated indoor swimming pool with an adjacent fitness room. There are several ski mountains in the area including Okemo, Killington, Suicide 6, Pico and Sunapee. There is no down hill skiing available at Ascutney. For you golfers, there are 5 courses only 15 to 45 minutes away. The village of Woodstock, about 25 minutes from Brownsville is known world-wide for its artisans, its artists, and the galleries that show their works. It is also home to the Billings Farm, the Woodstock Inn and the Rockefeller Woodstock Resort. Nearby is the Green Mountain Horse Association in South Woodstock. Close to Woodstock is the Village of Quechee where you’ll find the famous glass works factory of Simon Pearce with its retail shop of glassware and wonderful restaurant. Nearby on the Connecticut river is the Cornish Art Colony with the home of Augustus Saint-Gaudens and the Maxfield Parrish museum. There really is something for everyone any time of year! Our parents bought the cottage in 1977 as a vacation home. They always enjoyed staying there in all seasons. We have kept the cottage in the family as it always brings back wonderful memories. The cottage is the perfect setting and location to enjoy all that New England has to offer in any season or to just sit by the fire or on the deck and read a good book. Enjoyed the tranquility and beauty of rural Vermont. The rustic old schoolhouse was perfect for what my wife and I were looking for, and a better option than a hotel room, which is scarce in that area, for a multiple-day stay. I would stay again without question. My husband and I needed a mini vacation desperately so this house & back deck with a beautiful view of the stars was heaven sent. There was also a chiminea that we had a fire in every night, roasted marsh mellows, and sang while my husband played guitar. This was a quaint get away in the woods for us that we thoroughly enjoyed. The owner, John is very accommodating and a pleasure to do business with. Enjoyed our 4 night stay. Accomodations comfortable for 4 adults and the location was ideal for our planned activities. The only feedback I'd add is it would be nice if there were an additional upholstered/recliner type chair in the family room for evening movies. Would highly recommend.this.great, historical home! This property was a perfect fit for our visit to Vermont. The house was clean, well kept and in a great location. Communication with the owner was excellent and we'd be happy to stay here again next year when we visit.